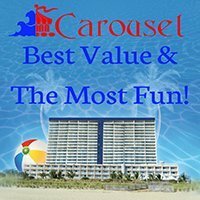 Returning to Ocean City this summer is the fun and exciting free event for the entire family, OC Beach Lights Spectacular! Beach Lights will begin Memorial Day weekend and run nightly through Labor Day from 9pm to 11pm. Special 3-minute displays at 9:00pm, 9:20pm, 9:40pm, 10:00pm, 10:20pm, 10:40pm, and 11:00pm. This lighting attraction features high-powered searchlights that accent the sky and surrounding area around N. Division Street and the Boardwalk. Searchlights move and sway, creating a dance of light to musical selections played through boardwalk speakers. The lights change into a variety of colors, bathing the surrounding beachscape and boardwalk in vibrant colors.